Extending a land ethic to the next generation is an important task. From time to time, you find someone who has concocted a unique way to do this. I was impressed, today, by our lunch time entertainment at the North American Duck Symposium in Memphis, TN. Four 'forest rangers' with the USDA Forest Service in Mississippi have formed a blues band, known as the Blues Rangers. They have written songs to teach conservation to kids, and they sing in local schools. We heard the Rattlesnake Blues, along with songs about invasive species, ducks (! ), habitat fragmentation, and prescribed burning (one of the guys in the band is a prescribed burning specialist with the Forest Service). The video clip here is a song about neotropical migrants and how they suffer from loss of forest habitat...."they got nowhere to land!" Enjoy, and think about ways you might follow suit? Joel Brinkley wrote a most interesting editorial about world birth rates this week. Brinkley's piece, "Falling birth rates portend a very different world," can be found here. Brinkley reports that only 116 of 224 nations have birth rates above the "replacement rate" (steady population) of 2.1 children per couple. Thirty-four countries, according to Brinkley, have birth rates lower than 1.5. The US is at 2.06, just below the replacement rate. What does this mean to predictions for world population growth? "Demographers say the world's overall population will continue growing in the decades ahead but eventually will begin to stagnate and drop -- perhaps later this century. That does offer some benefits. The World Bank's dire prediction -- food production worldwide will have to increase 66 percent by 2055 -- may not turn out to be as problematic as predicted," Brinkley writes. Some early signs of impacts? Brinkley suggests that the current crisis in the milk industry of the US stems from the fact that there are not as many children to drink milk--leading to overproduction which has led to the need to subsidize prices for milk farmers. Other industries, such as the housing market, will continue to see impacts--as fewer new owners will be in the market. How is this connected to landscapes and conservation? Many folks have all but given up hope for natural landscapes in states like Nebraska--the mantra that we have to pull out all the stops to "feed the world" is emotionally hard to argue with. 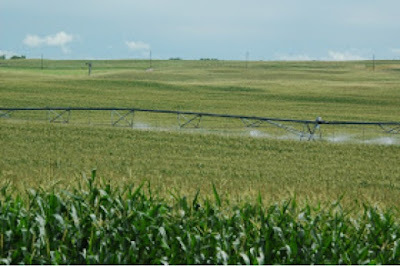 I mean, who wants to make babies in Africa starve, if we can solve the problem by ripping out some more prairie and putting in some more irrigation pumps to produce more corn? And, it turns out that the babies are also competing against ethanol for that corn, as well. Landscapes versus food is one thing; landscapes versus food AND fuel is not a fair match. There are many who suggest that the "feed the world" argument is a straw-man argument in the first place--most of our ag exports goes to wealthy nations, not starving nations. But, even if we assume we can produce our way to feeding the world, falling birth rates have to be seen as good news. Ag production cannot be the only focus--education of women, contraception, and economic development all lead to lower birth rates and fewer mouths to feed. And, in the end, lower demand for food means more water in our rivers...where it belongs.